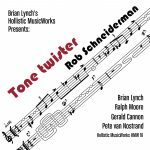 Hollistic MusicWorks is proud to announce the upcoming release of renowned pianist/composer Rob Schneiderman’s Tone Twister, his first new album in over ten years. This joyously swinging quintet date features the talents of a truly all star lineup; tenor saxophonist Ralph Moore, bassist Gerald Cannon, drummer Pete Van Nostrand, and trumpeter Brian Lynch, who produced the album for his Hollistic MusicWorks label. This stellar crew makes great music and produce memorable moments on eight original Schneiderman compositions, along with Rob’s take on the classic “Unforgettable”.